Indo-Greek, Bactria, Zoilos II, some time between 75 and 30 BC. Silver drachm. Denomination : Silver Drachm. Mint : Jammu. Date : The exact dates of Zoilos II's reign are not known, and depending on which reference you use, you might see his reign listed as started anywhere from about 75 BC to 50 BC, and ending anywhere between 50 and 30 BC. Size : 15.8 x 16.7 mm. Weight : 2.21 grams. Obverse : Bust of Zoilos II right, with BASILEWS SWTHROS around the top, and ZWILOU below. 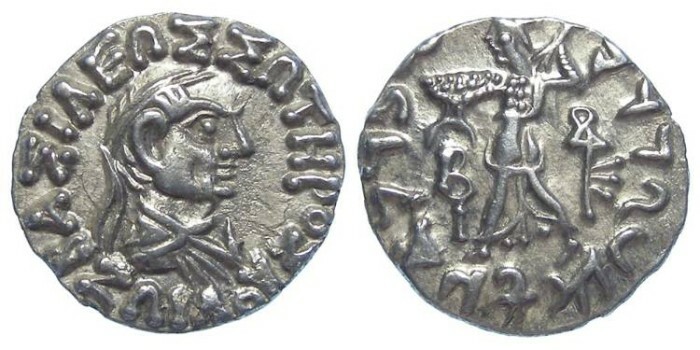 Reverse : Athena Alkidemos advancing left brandshing a spear and shield, with a Kharosthi inscriptions that reads "Maharajasa tratarasa" around, and a mint mark to the right.